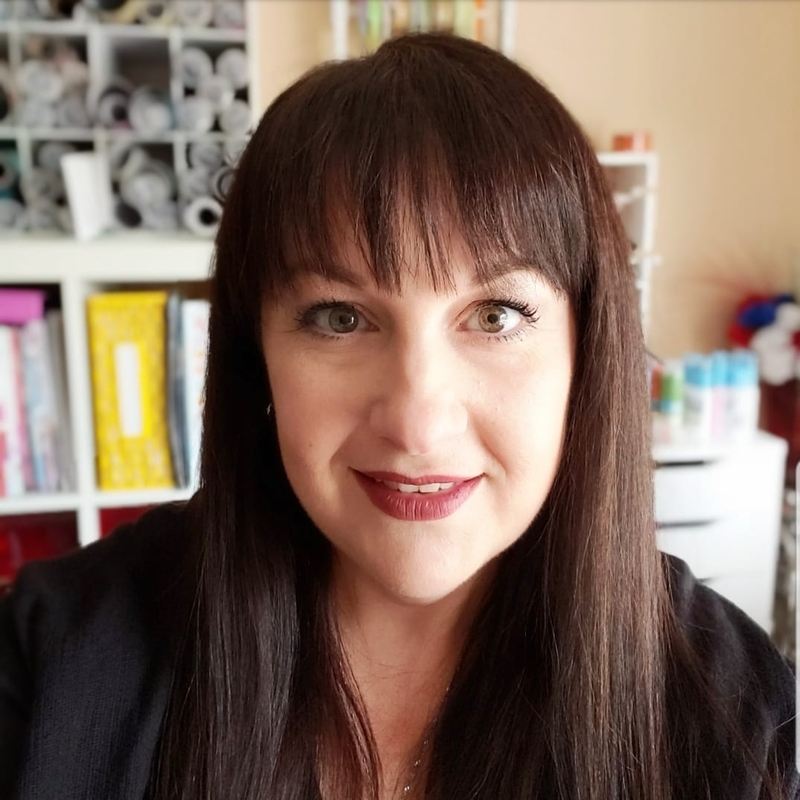 If you’re like Aleisha and me, you’ve been using hot glue guns to make crafts for years. They’re just so darn handy sometimes and who doesn’t love how fast the glue sets? 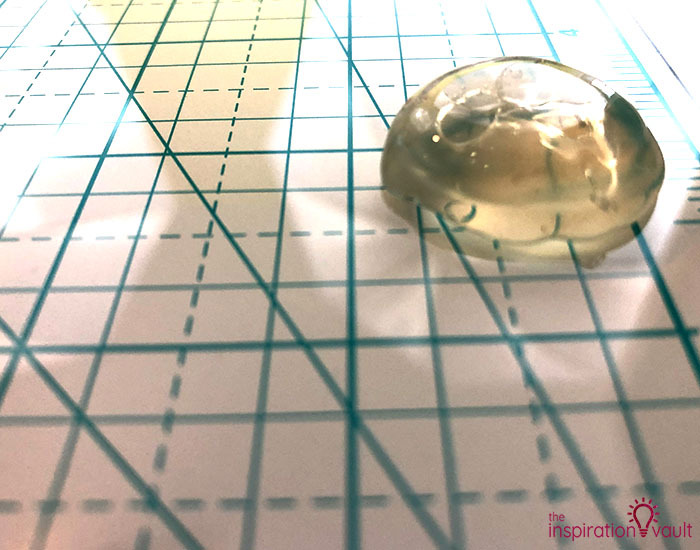 So when I was challenged to come up with a craft idea using hot glue for the Craft Lightning, I figured I had that one in the bag. 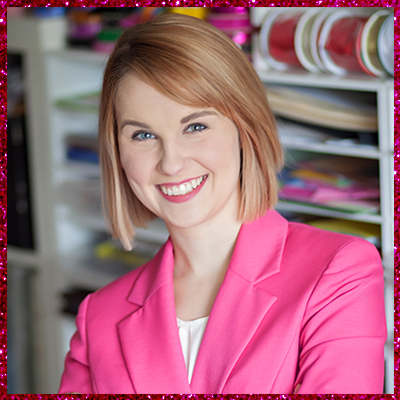 That was easier said than done, though, so I went to my crafty best friend and partner in crime for ideas. 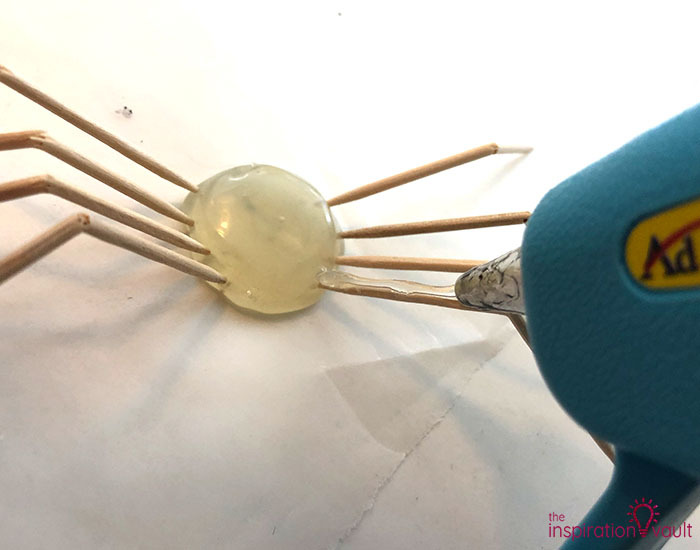 In no time, she came up with this simple yet genius way to make Quick & Creepy Hot Glue Spiders. Brava, Aleisha! 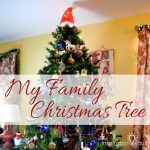 And did I mention you can make one of these in less than 15 minutes? 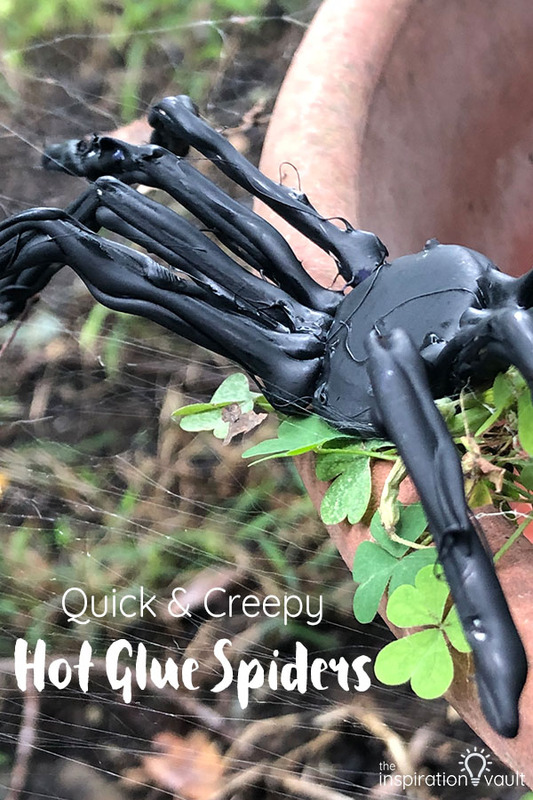 Yep, these spiders are thrifty, creepy, and quick to make. 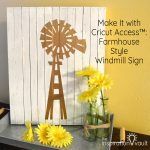 1: Load up your glue gun and set the temperature to high. 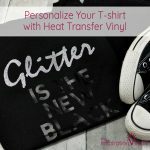 Once the glue is hot, squeeze out a quarter-sized disc onto the wax paper or glass. Add another layer on top of that and repeat until the body of the spider is the size you like. 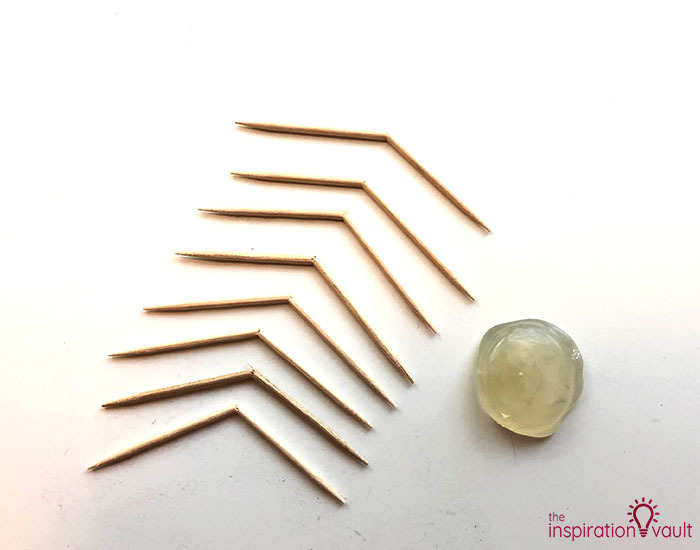 2: Now snap and bend 8 toothpicks without breaking them apart. 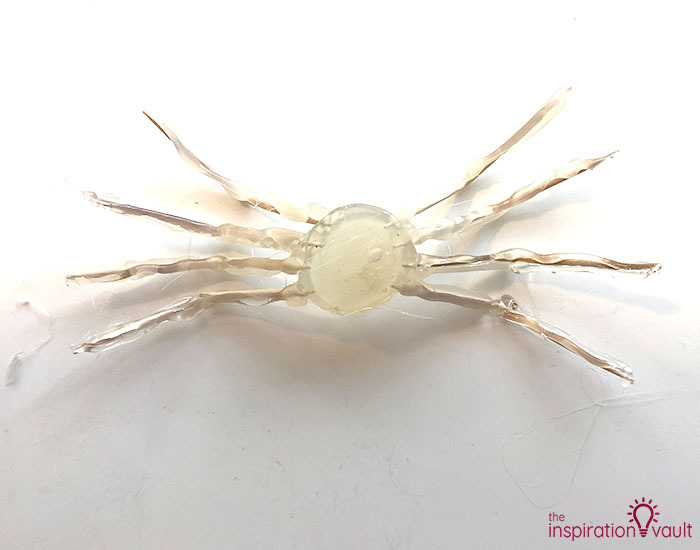 These will be the spider legs. If any of them look weird or too jagged to be legs, just toss them and make more. 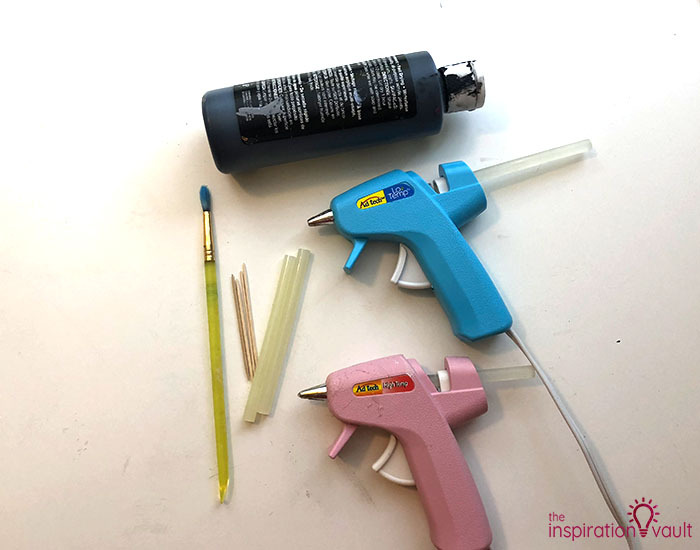 3: Switch your glue gun to low temp. (Or just switch over to your low temp gun.) 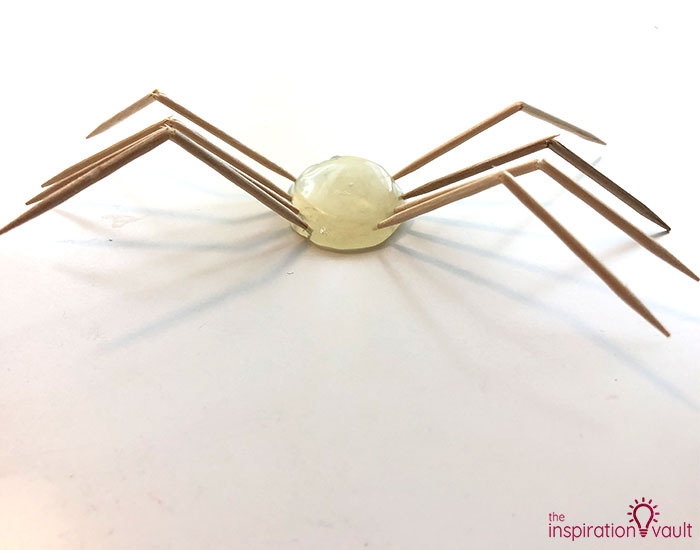 While it’s cooling down, poke your bent toothpicks into the spider body, four on each side. 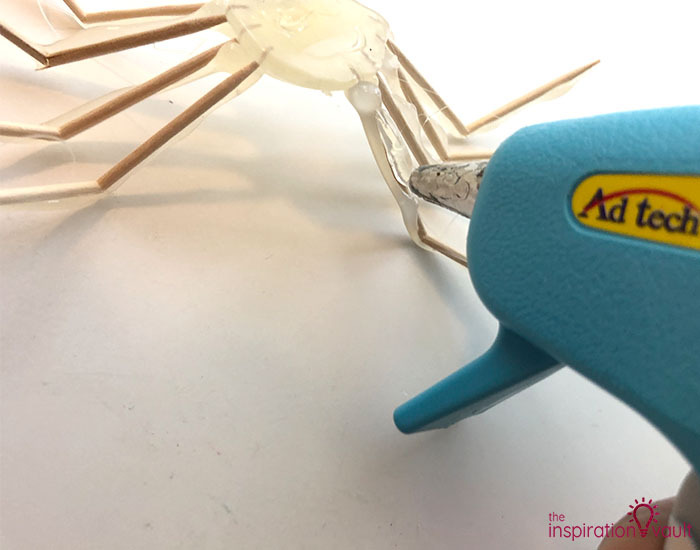 4: Once the glue gun has cooled down, carefully squeeze a line of hot glue along the top of each leg. Let those cool completely. It should be pretty fast. 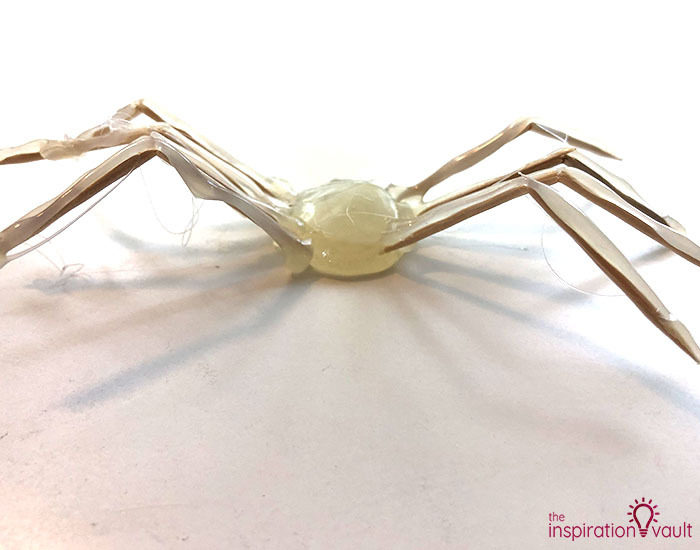 5: Flip the spider over and squeeze another line of hot glue along the bottom of each leg. Let that cool/ dry completely. 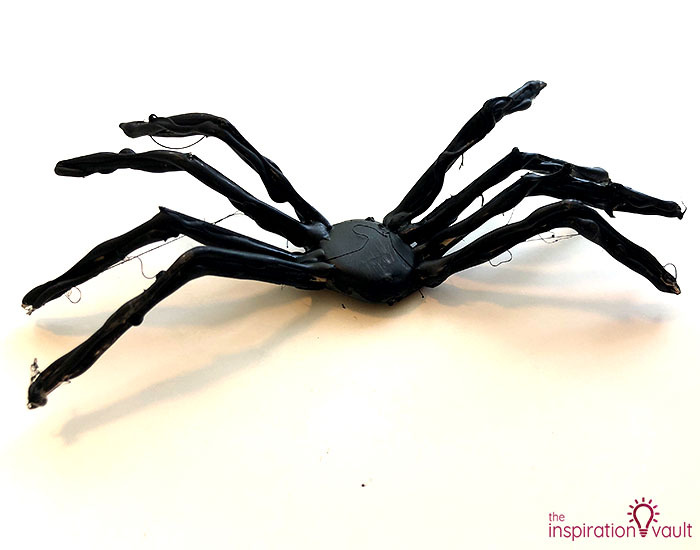 6: While the spider is on its back, paint it black. 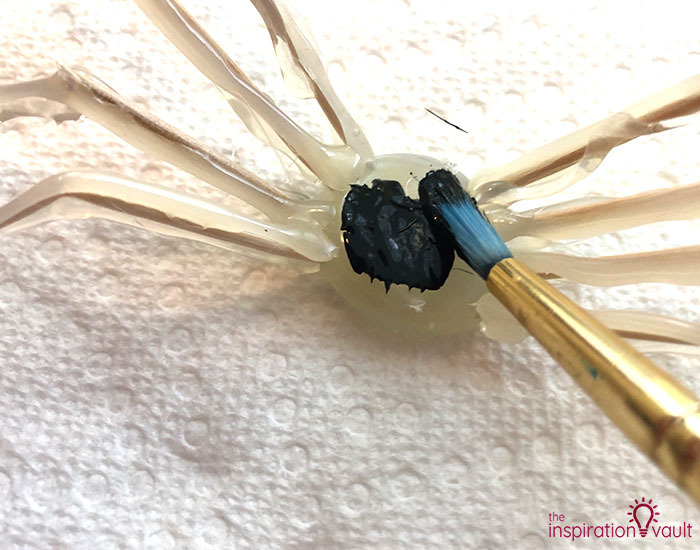 Once the glue is dry, flip it back onto its feet and paint the top areas black. Let that paint dry. 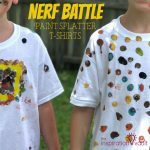 The paint should dry pretty quickly, too. Spray paint should dry really fast as long as you don’t spray it on too thick. That’s it! 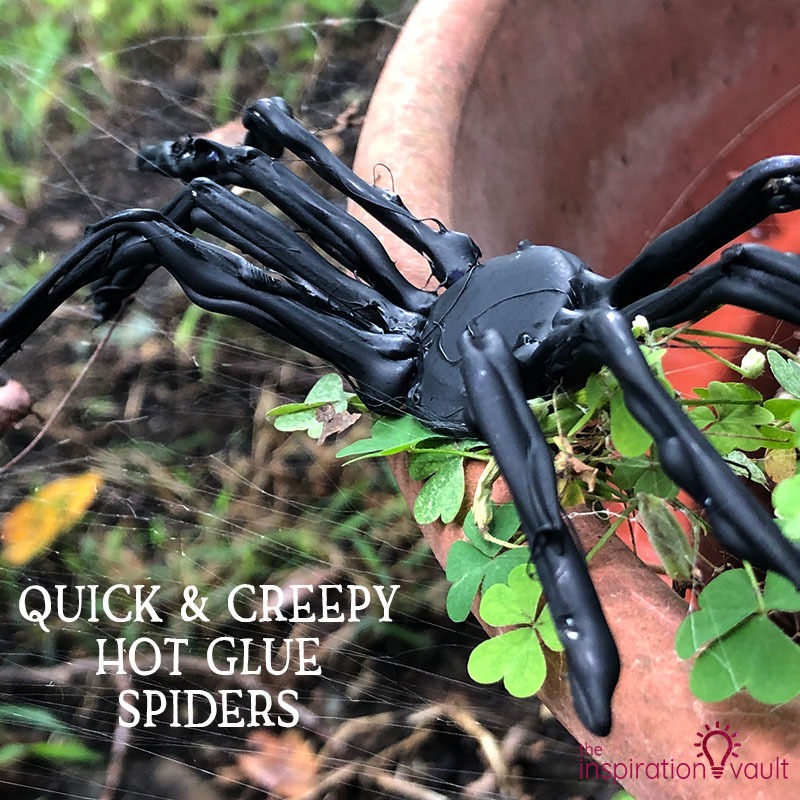 These Quick & Creepy Hot Glue Spiders turned out so well I think. They look pretty realistic for being made solely from toothpicks and hot glue. 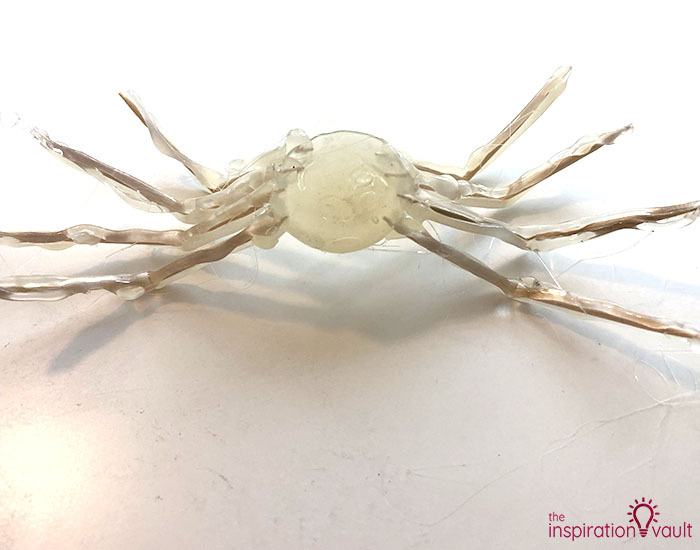 Aleisha pointed out that you can even leave some of those dreaded hot glue strings attached to the spider legs to look like webbing, which is such a great perk. You could also take some red or white paint to dot on some creepy spider eyes if you wanted. 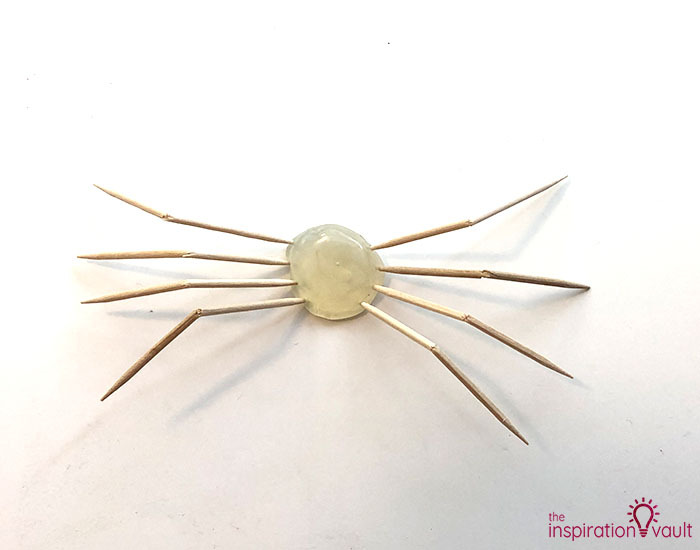 She said that they’re pretty lightweight, so they’d be easy to position in spider webbing for your Halloween decorations, too. 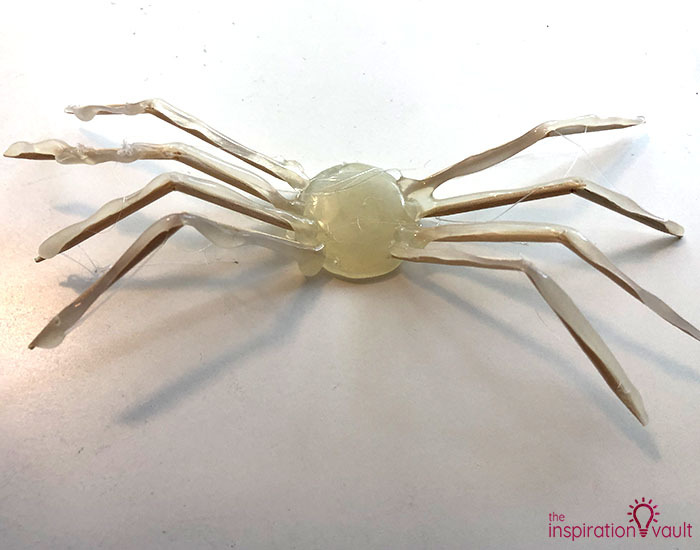 So what do you think, would you try to make one of these Hot Glue Spiders? 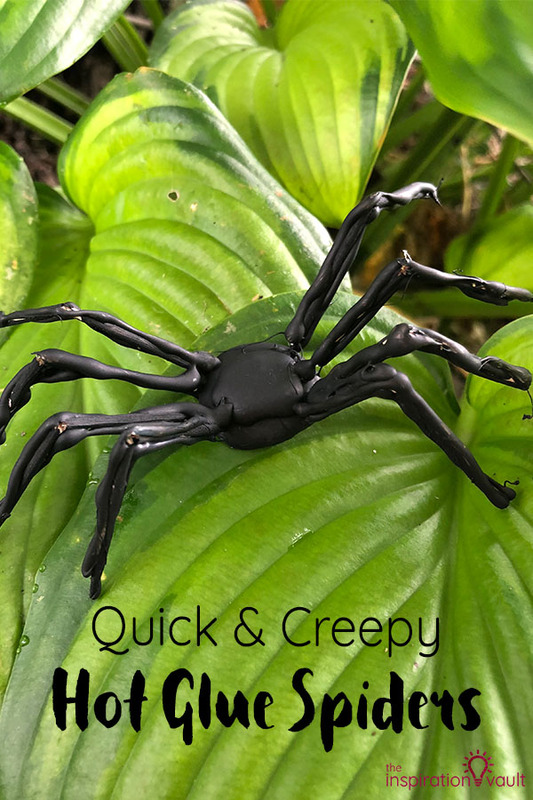 If you love creepy spider Halloween decorations, you’ll definitely want to check out my Ghastly Spider Egg Door Decoration. 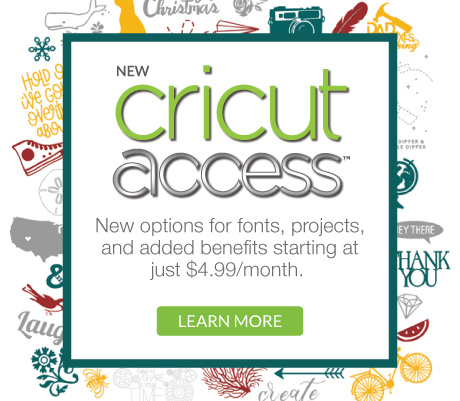 And if you are looking for as many spider projects as you can find, All Free Holiday Crafts has pages and pages of awesome crafty ideas! 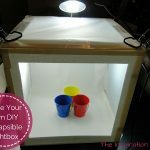 As I mentioned above, this project is part of a Craft Lightning Challenge where we’re challenged to make a hot glue craft that takes 15 minutes or less. 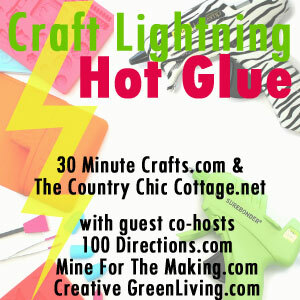 Be sure to visit our crafty hosts above to see some other some other amazing crafts you can make with hot glue! So creepy and cool! Thanks for joining!